Correct response: Who is Lewis Carroll? The poem, titled “All in the golden afternoon…”, was a prefatory poem to Lewis Carroll’s Alice’s Adventures in Wonderland. It recalls the afternoon where Carroll met Alice Liddell (“Secunda” in the poem) and her two sisters Lorina and Edith. You can find the full text of “All in the golden afternoon…” here. Didn’t get the thing you wanted for Christmas? 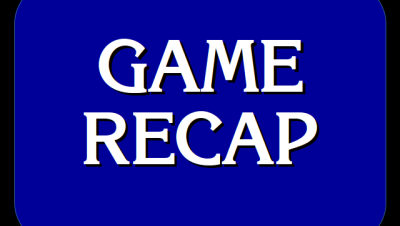 You can still get all of the items from The Jeopardy! Fan Online Store. Here are our top sellers; all prices are in US dollars! 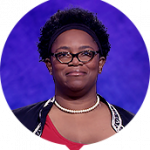 A player with scores going into Final Jeopardy! of $32,600 and $21,400 in their first two games, on average, will have $117,222 in future winnings after their 2nd win. 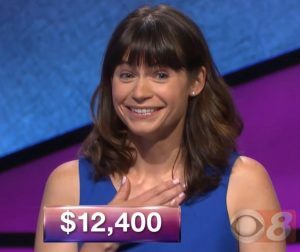 17 Comments on "Today’s Final Jeopardy – December 25, 2017"
Had Donna just wagered the conservative, required 3.401 she would have won with 17.999, since Natalie stayed put. Unusual wagers,especially by Natalie. She must have sensed that Donna would wager big and would miss?? Well, congratulations to Natalie either way and again, Happy Holidays to all of you! Aloha and MELE KALIKIMAKA from Maui! Yes, I’d imagine Donna is wishing she made that $3401 bet. Or maybe a $2020 one ;-). Methinks Natalie got a bit lucky by not wagering to win, and Donna got caught being greedy again, after it paid off for her in her first game (though, here she bet outside the margin if you assume the 2nd place player bets $0, so Donna shouldn’t have bet more than $8999). But I could see what she was doing. It’s the betting strategy Austin used to get above $60K one game. If you assume your opponent will bet to pass you and get the answer right, you have to be right to beat them anyway, so you can play in the margins to see if you can bet more than just enough to cover (but, like I said before, not betting more than would take you under their current total if you’re wrong, since that’s the most they could have if they’re also wrong, but bet $0). 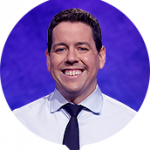 Except that Austin did it in a two-player Final Jeopardy; Donna’s wager here is what Keith Williams would have termed a “Lazarus” wager, as it resurrected Charlie from the dead, as it were. Merry Christmas from Route 66! My mom will be opening a boxing day gift from “The Jeopardy Fan” online store once the family assembles at Grandma’s house tomorrow. Andy, hoping you get That Call in the New Year! Kind of funny that a “Natalie” won the episode aired on Christmas day…! Donna was cocky and greedy, but she seemed more cocky than greedy. Can anyone tell me when where this was aired on tv or how i might be able to watch it please???? Natalie is a lovely winner, but I really enjoyed Donna’s 2 appearances on the show. She seemed to have a sense of wonderment at her own ability! And she hugged the other contestants. I don’t remember ever seeing that in all the years I’ve watched the show.